This pressure cookers full name is the instant pot ip-lux60 6-in-1 programmable pressure cooker. This really is a pressure cooker with some nice features. The one I like is that you can also use it as a slow-cooker. The 6 functions of the instant pot ip-lux we will discuss in detail are all easy to use and functional. One feature that comes in very handy is the delay timer. This will make it possible to start the cooker at a certain time and the food will be done when you come home. This Instant pot programmable pressure cooker has some nice features that are not just to make it fancy, but are really usable. I apologize for the weird sound in this video, but for now it was the best review video I could find. I was curious what the 3-ply bottom stainless steel bottom in the cooking pot was and did some research on it. 3-ply meant that they have used 3 layers for safety and even heating. The 2 outer layers are stainless steel and the inner layer is aluminum. The stainless steel is used for durability and the aluminum for even heating. With its weight of over 14 pounds this is a pretty heavy duty pressure cooker. The used materials keep the outside cool while in use. Only the top and the lid will get hot. Safety is a very important part of a pressure cooker. Here is a picture of the 10 safety measures of the instant pot ip-lux60. You can click on it to see a larger picture. I read that it can be used for canning. This came from over 1230 customer reviews. The lower star ratings can mean that there was the occasional lemon. There were also people who just could not get used to cooking with and that is why they gave it a low rating. Here is an example. if I see a 2 star rating and the comment is “too complicated for me and not big enough returned it” I think this has nothing to do with the product quality but a personal preference. That is why I always try to read the lower ratings first. We always recommend to use any product as fast as you can and send it back if there is a problem. Amazon is real good with their return policy. Many people loved the set and forget for this instant pot ip-lyx60 electric pressure cooker. It will shut itself of or keep the food warm till you are ready to eat. The convenience of an electric pressure cooker is that you do not have to watch it like the ones we use on the stove. One comment mentioned they could not cook on low pressure, but to be honest I have never heard of a low pressure cooker. The most appreciated feature is the pre programmed setting. This is great to start with to get the hang of cooking with this pressure cooker. After that you can start using your own programming and your own settings. The delay start mode in combination with the keep warm mode is mentioned many times as one of the best features for working people that do not have to much time to cook. There was someone that mentioned you can use this for canning, but the official website does not recommend the use of the instant pot pressure cooker for canning. You can read that here http://instantpot.com/ and type in the keyword canning. 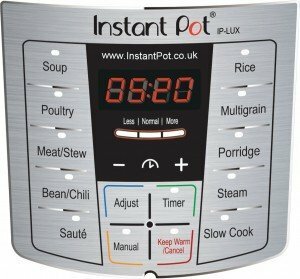 Overall if I think that this Instant pot ip-lux60 6-in-1 is a good buy and we can recommend this product. However keep in mind that there are occasional lemons and send it back right away if you are not satisfied. Can be used for canning there should be some advice on the Instant pot Website. The Instant pot 7 in 1 pressure cooker IP-DUO60 can be used for low pressure cooking and has the feature of making yoghurt. Have a look at all our Electric Pressure Cooker Reviews here!